With smartwatches becoming so popular, many kids have been feeling left out not having one, while their parents and siblings use their Fitbits. But now smartwatches for kids are being developed. They have lots of fun and practical features for them, like games, music and photo features, while also letting you locate them, call them and keep in contact with them. Some models even allow you to remotely turn features like cameras and microphones on so that you can see and hear what’s going on around your child. But, with so many features and models popping up, it’s hard to know what’s the best type for you and your kid. This buying guide will tell you everything you need to know before you buy and give you a product review list to get you started with your search. 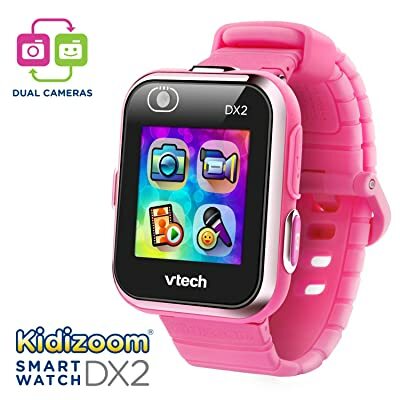 The VTech Kidizoom DX2 Smartwatch is a great choice for younger kids. It’s listed for ages 4-12. There are 2 cameras on it, and you can take both pictures and videos. It makes taking selfies easy. You can turn the pictures into watch faces, similar to making pictures into backgrounds on your phone or computer. There’s a monster catching game that seems a bit like Pokemon Go on it. It’s described as an augmented reality game in which you can capture monsters in the world around you. There’s also a motion sensor on it for active play and game challenges. It’s “splash-proof”, so a little water won’t hurt it, but you can’t fully submerge it. It’s not safe to shower or bathe with it on, either. The Micro-USB cable that comes with it not only lets you charge the watch, but you can upload photos and videos to the computer from it, and you can download new games and seasonal watch faces from VTech, as well. It also helps kids learn to tell time. There are both digital and analog watch options, for two different ways to learn. Everything on the watch is accented with fun sound effects, which the young kids will love. 2 Cameras and lots of ways to customize them. Games and active game challenges. The only available language on it is English. The screen isn’t a very high resolution. This particular smartwatch model not only has a camera on it, but it also has a ton of photo effects, frames, and filters. You can record video, too. It’s easy to take pictures with it, thanks to a one-touch capture photo capture system. And there’s a voice recorder with voice changing effects. There are lots of ways for your child to express their creativity. There’s lots of storage to hold the photos and videos they create, too. There are also calendar and calculator features to keep your kid organized and help with schoolwork. There are an alarm, timer, and stopwatch, as well. The watch display can be either digital or analog, which helps children to learn time. And, the watch has over 50 clock frames that you can switch and customize. Aside from the learning and creative options on the phone, there are also lots of activities and games: 3 activities, 5 games and 3 action challenges that work with a motion sensor in the watch. There’s a Micro-USB cable to charge it and upload photos to the computer, and you can download more games through VTech. If you don’t want your child to be playing the games for hours every day, you can limit their access to them via parental controls. It’s also splash and sweatproof. Some water is okay. Just don’t submerge it, take a shower or bath with it. Lots of creative photo and video options. Only has a 3 – month warranty. It’s a little large and bulky. This smartwatch is compatible with 3G data and voice calls, video calls, and is able to make and receive phone calls. It shows you, in real time, the location of your child. The location data is secure because all of the location data is encrypted with a 128-bit algorithm, making it less likely for someone to be able to hack and intercept the information. There’s an SOS button that calls parents and gives them a location alert with live recordings of surrounding sounds. There are also several things you can do through the app. You can authorize certain numbers to call your child, and block others, you can listen to audio remotely, and you can set up geofencing. This means that you can set a perimeter distance, and if your child goes outside the authorized area, you get an alert. One of the most interesting features of this watch is the make a friend feature. If another child is nearby and has an S2 on, your child can shake their watch and “make friends” with them. They can then exchange phone calls and texts. Doesn’t come with a SIM card, so you’ll have to get one. Only uses AT&T or T-Mobile SIM cards. 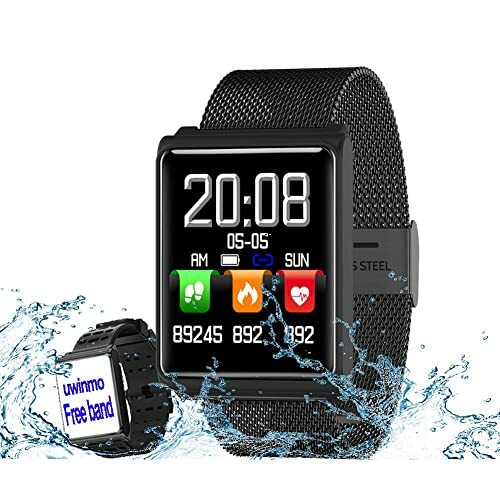 This smartwatch has a phone on it and a SIM card slot, but the SIM card is not included. There are lots of features that make this watch a good choice for Teens and older kids. There’s a sync feature that lets you get notifications from Whatsapp, Facebook, Twitter, and email. Not only that, you can view and reply to messages from the apps, as well. There are 4 different sports modes that record things like running and calorie burning with a pedometer. With GPS it can show the location and make a map of your running route. Lots of smartwatches record your heart rate, and this one does, as well, but this one also records your sleep patterns. There are other functions on it to keep you active and healthy, as well. There’s an alarm that goes off if you’re sedentary for too long, to remind you to get up and move around and an alarm that reminds you to drink water. It records how long you sleep and what kind of quality of sleep you get. As far as general watch functions, there’s a compass, a world clock, an alarm clock and a stop watch on it. There’s a camera that takes pictures and records videos. And there’s a music player, which teens will love. Social functions: Social media and email notifications, view and respond to messages. Lots of ways to monitor your health and keep you healthy and active. Doesn’t come with SIM card, so you’ll have to get one. 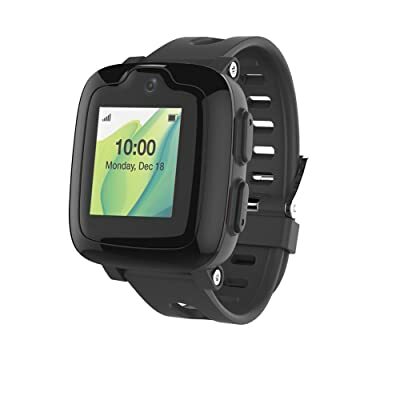 This smartwatch has lots of features and is very durable, which makes it perfect for an active teen or tween. 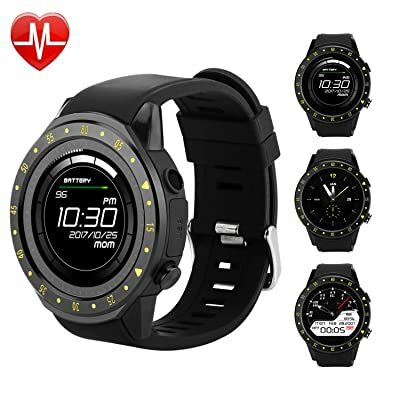 It has a multi-function interface that has a time display, timer, stopwatch, pedometer and calorie counter, distance tracking, notification display, alarms, tasks, and a sedentary reminder. It features all of this on a 1.3 inch HD high sensitivity touch screen with a clear, large display. Because of its HD screen, it has great picture quality. It has lots of modes on it that are great for sporty kids. There are different sports modes for walking, running, football, badminton, baseball, and cycling. They can track and share their exercise achievements with friends and family, challenging them to get more active, too. It’s extremely durable and long-lasting. It has a battery life of 5-7 days on one charge with normal use and 15 days on standby use. It’s high-quality waterproof, having an IP67 waterproof rating. This means you can wear it while washing hands, walking in the rain, etc. It’s got a steel strap that’s very durable and strong, too. And, one of the best features is their satisfaction guarantee policy. If you don’t love it, you can return it for a full refund, no questions asked. Can only work up to 10m from a phone. Can’t respond to texts or messages through the watch. It just notifies you of them. This smartwatch has accurate GPS and wifi positioning that provides fast, accurate, real-time tracing using wifi and the latest technology. Through this, it also provides you with an anti-loss feature. You can see your child’s location through an app. There’s a phone on the watch that supports 2-way calls, SOS emergency calls, voice chat, and SMS text messages. It can also work like a walkie-talkie. Through an app, you can remotely access a camera and voice capabilities through it, so that you can see and hear the world around your child. You can also create a customized security range and when the child goes outside it, you’ll get an immediate notification. While your child is busy, you can set up to 3 non-disturb periods during which calls are automatically blocked. This is good for school, church or other activities. There’s a pedometer, activity trackers, clock, a math game, camera and flashlight on it. 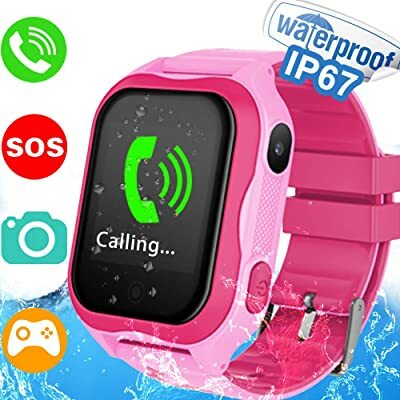 It’s IP67 waterproof, which means it’s safe while kids bathe or swim. And, probably the best feature is the SOS emergency call feature. When the child hits the SOS button and holds it for 3 seconds, it calls up to 3 different numbers. It calls each of these numbers twice, in case they don’t answer the first time, too. Excellent SOS emergency call system. Lots of ways to remotely view and access the device via the app. SIM card may not be delivered with the watch, you may get it a few days after you get the watch. You have to buy a data plan through cell phone companies, and getting one that works with this watch is difficult. Upon first glance, this watch looks like it’s pretty no-frills. But, the features that it does have are excellent. It supports a SIM card so that it can do GPS location. For its GPS tracking feature, it uses 3 different systems: assisted GPS (AGPS), local base station and wifi. The combination of the 3 makes for accurate tracking. You can do several things via the app that comes with it. You can use geofencing, which alerts you whenever your child leaves a pre-designated, authorized area. You can set quiet times that will restrict functions during certain times of the day so as to not interrupt class or other activities, without affecting the SOS button’s function. And, it can perform voice calls and messages between the watch and app. There’s an SOS emergency button that calls for help after the child hits the button and holds it for 3 seconds. And, it’s IP67 waterproof, so it’s safe for handwashing, sweating and swimming. Lots of features to access through the app. Doesn’t come with a SIM card. Only supports T-Mobile and Speed Talk SIM cards. Only has a 24 – hour clock or “military time”, and not a 12 – hour clock. This smartwatch does a lot of the same things as some of the more expensive watches do, but it costs less, has fewer frills and would be easier to operate for an older kid that had never owned a smartwatch before. It would be great for a tween-aged child that didn’t need things like social media access and notifications. It gives you real-time, accurate GPS location tracking of your child and it reports movements, as well. It has a push-to-talk intercom that works sort of like a walkie-talkie and doesn’t require making an actual phone call. It also does voice calls through the cloud, and 2-way calling through the sim card. It has a flashlight, games, alarms, and a weather forecast feature. Through the app, you can set up geofencing, so that it alerts you when your child travels outside a certain range. You can do remote monitoring through it, as well. And you even have the option to do a remote shut-down from it, meaning you can turn the watch off if you want to. Has lots of features and is comparable to other, more expensive models without the price. Voice calls through a cloud and push-to-talk intercom. Requires a SIM card that isn’t included, so you’ll have to get one. Some of the smartwatches for younger children won’t have features that teenagers will want and vise versa. Generally, if it has games on it for 3-9 – year-olds, teenagers aren’t going to want it. For teenagers, look for features where they can be both active and social. 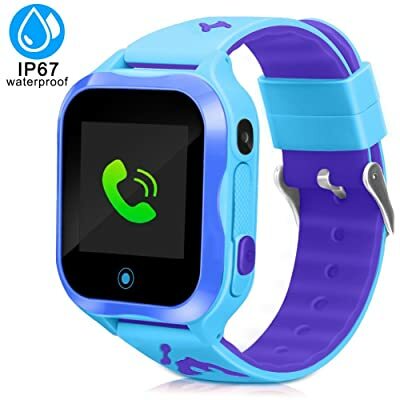 Not only can some of the smartwatches for kids cost a couple hundred dollars, but they can also have features that require monthly subscription fees. The models with GPS features will likely require a SIM card, and it may not come included. The watch may only work with certain providers, too. Some carriers charge a fee for SIM card activation. Not only that, you’ll likely have to purchase a monthly data plan. So, read the product description, comments and answered questions carefully. This one is especially important for younger children. Some models are simply “splash-proof”, which means that if some water gets on it, it won’t be affected. But, it isn’t a good idea to wash your hands, shower, bathe or swim with these models. So, consider looking for a model that says it’s fully submerge-able and waterproof, as opposed to “splash-proof”. No matter what age child you’re buying the smartwatch for, you’re going to want one with a long battery life. No kid wants to stop having fun and playing just to charge something. So, the less charging, the better. It’s also important to know how easy the watch is to charge. If it comes with a micro-USB cord, but no way to plug it in the wall, unless you own a computer you’ll need to buy a blocking apparatus that the cord can plug into. If it uses the magnetic base system, those can be a pain to line up right. So, don’t forget to read about the charger, as well. Smaller children are going to appreciate the entertainment features on some smartwatches. If you’ve got a child that likes to take pictures, consider one that has a camera and has photo filters and effects. Most children are going to appreciate the games on these watches, but if you want them to be active, as well, look for features that say they use a motion detector. These include sport and exercise activities and turn them into games, so the child will exercise and have fun at the same time. If you’re worried about your child using the watch and getting in trouble in school, there are some models that prevent this. Some watch block phone calls and certain features during certain hours so that they can’t use it during school. You can also use the parental settings on some watches so that they can’t play the games until you unlock the features. This is helpful for school, church, etc. If your child is just learning to tell time, there are watches that display both digital or analog watch faces. If your child is doing the math that requires a calculator, there are models that have them. There are also calendars if you have a child that’s old enough to keep track of homework assignment due dates and other important dates. Some models have pedometers and timers, so if you have a child that runs track or participates in other sports activities, these could be very useful features for them. Some models are pretty much solely designed to keep track of your kid. Some features include GPS location and tracking, remote camera viewing, and some can even remotely access the microphone to let you hear what’s going on in the world around your child. Some have loss prevention systems in place. One of the features that will provide a lot of peace of mind is called an SOS emergency call. Once your child holds a button in for a certain number of seconds, the device will call you. After that, some models turn the camera or microphone on so that you can view or hear what’s going on around your child, and some turn on the location. It’s a nice feature that should help to ensure that your child will remain safe. So, as you can see, these smartwatches come with a variety of features, and you can use that to find one to fit your child’s personality and needs, while also fitting your parenting style. They’re as unique as your child is. 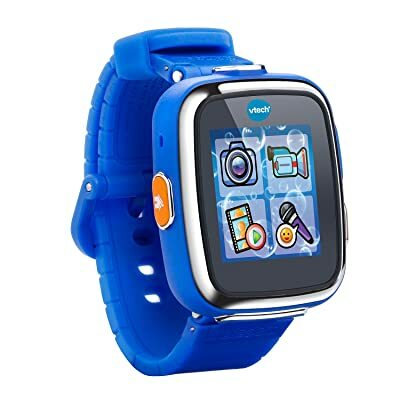 The VTech Kidizoom Smartwatches are the clear standout entries on this list, with all of their games and features. But they wouldn’t be great for an older kid, so refer to the list for picks for teens and tweens. 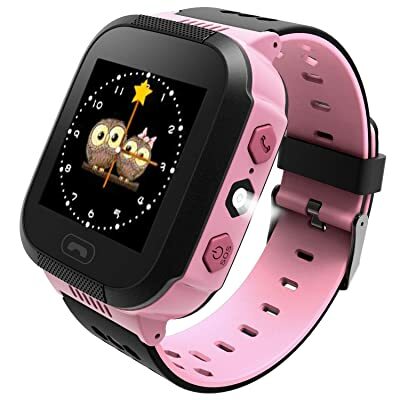 Now you should have everything you need to start shopping for the best smartwatches for kids.